Water Temperature: 60 degrees, depending on depth. Rudy of Livermore caught a 20 lb. catfish while fishing on the first dock, and he was using chicken livers. On 10/9/17, Sam of Pleasanton caught his limit of trout early in the morning and he was using power bait. On 10/10/17, Sam caught his limit of trout fishing from his boat. 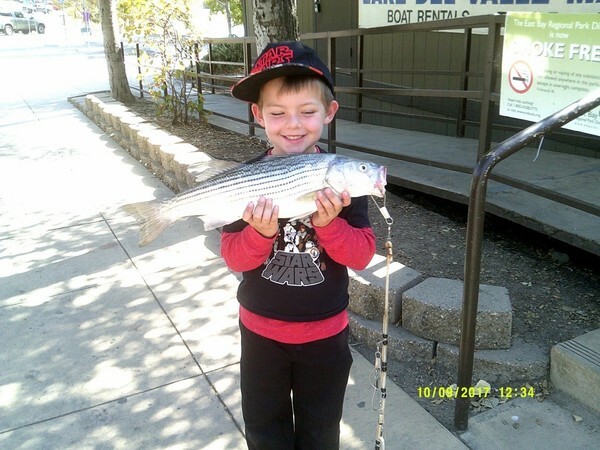 Moji of San Ramon caught a 25-inch trout and he was using power bait and fishing from the Stanley shoreline. Gavin Haus of Pleasanton caught a 19-inch trout fishing off of the first dock. He was using power bait. C.B of Alamo caught and released a 5lb. bass on 10/13 and he was fishing in the arroyo. Gabreil Rezendez caught and released 5 bass float tubing in the arroyo and he was using Senko’s.